I was having such a great day today - was totally knocking it out of the park with my goal of holding Evan as much as possible (he spends too much time being hushed & shushed while we run after Ben most days so I'm trying to make up for that), got our TV antenna fixed FINALLY & other such wondrous things. Then I made the mistake of grabbing our mail before picking Ben up at day care. *sigh* Did I expect to win the $200,000 grand prize? No. I would have happily settled for the $10,000 weekly prize. 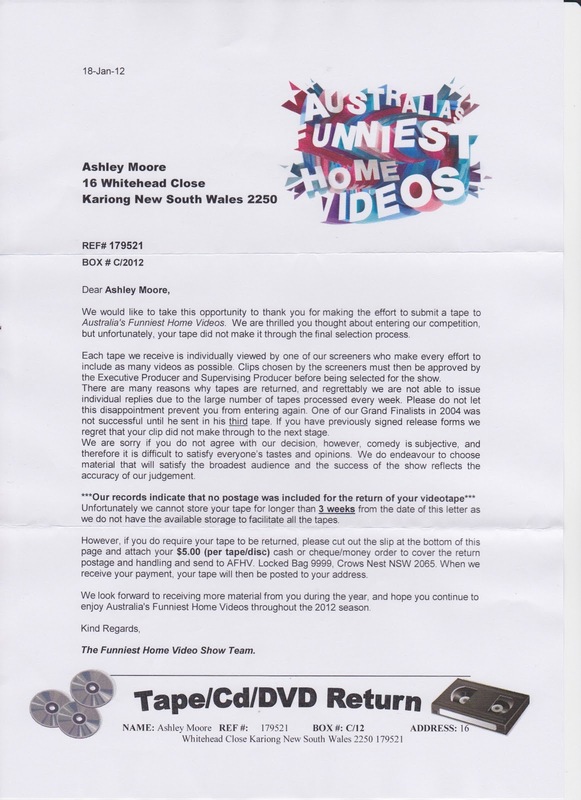 Let's be honest - I would have peed myself with delight to get the $500 for them just playing the darn clip. But nooooo, we were DENIED. Let me make it clear how badly we were denied. I sent the DVD off on Friday last week - it's now Thursday. 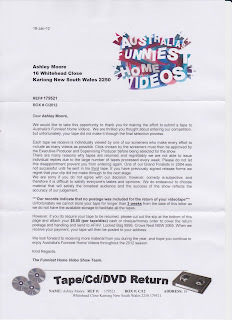 They received it, watched it, deemed it unfunny & sent us the rejection letter in SIX DAYS! Nothing gets done that quickly. Ugh. Granted, I realize the show probably has more than enough clips of kids blowing out birthday candles but I thought ours was far superior to most I have seen on air. Whatever. I appreciate the line that says "comedy is subjective" as if the people who peddle groin hits & old people toppling over are the grand judges of hilarity. I can't argue with their choice of clips of cats clobbering babies & toddlers but come on people, this ain't Shakespeare. Maybe we need to invest in a pet to mix with our kids & THEN my dream will come true. If you agree with them that it's not funny enough, I highly advise you to keep it to your damn self lest I smack you with a shoe. And lest I film myself smacking you with a shoe & attempt yet again to get on this stupid show. Anyway, onwards & upwards ... I guess. Those people wouldn't know funny if it slapped them in the face! !